This is my desk in my dorm at a previous university that I attended. Note: I did not make this mess - my roommate's friend did. This is my actual desk space at my dorm from my freshman year of college. I’ll be the first to admit that my room wasn’t always as clean as it should be. However, I did not make this mess. This mess was created by a friend of my roommate, who I wasn’t even friends with. She would storm in, unannounced, and act like my side of the room was open season for her to sprawl all over. Even though I was staying at my boyfriend’s apartment for the meantime, that did not mean she could act like it was her room. She never asked for my permission, and my roommate just let it all happen. As you can see from the photo, she decided to use my desk space to feast on, paint her nails, iron her clothes, and leave her makeup and razor on my chair. The worst part is that she did not keep it cleaner than she found it. Many of my personal belongings are meddled with and knocked over carelessly. It’s funny because she wasn’t even a student there anymore, but pretended to be a student to hide from her parents who didn’t know she failed almost all of her classes. Living in a dorm comes with a cost – and I don’t mean the money aspect. I mean the risk of roommates, even the ones who don’t even belong in your room. Back in Fall 2016, I attended a private Christian university named Charleston Southern University. It is located in Charleston, South Carolina. At first glance, going somewhere fifteen hours away and getting the luxury of freedom and the breeze of the Atlantic Ocean nearly thirty minutes, away is not a bad idea. Boy do I regret going there. 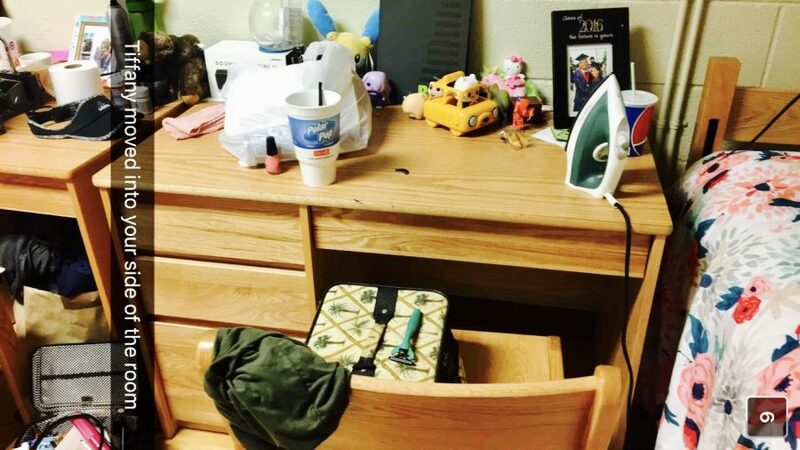 At this school, residential life places a student with two other roommates, unless a student already knows far in advance who they want to room with. That way, they get first dibs on the room and possibly not having to room with anybody else. As a freshman in college, your only option is having your roommates be selected through a matchmaking process that utilizes a small survey based on hobbies, interests, majors, etc. that you’ve taken. So what did I get stuck with? Two random roommates that I have never met before. My chances of getting along with them were 50-50 since there’s two of them, but I’d much rather like both of them. At the end of the semester, it was easy to decipher who was the good roommate and who was the bad roommate. I’m going to leave their names out of this because I’m talking about the struggles of dorm life. Although, the people you live with is a huge part. I’m going to explain this as simply as I can because there is only so much that I can ramble on about dorm life. The good roommate communicated with me when we needed to get our room cleaned for room inspections, which occurred twice a month. The bad roommate helped clean up once maybe, but ditched our inspections most nights when she said she’d be there. She also needed to do her laundry one day for inspections and I kept bugging her to get her part done because I was not going to be responsible for her dirty laundry. Then when I peeked into her laundry basket, I noticed a swarm of ants crawling all throughout her clothes. That’s when she finally decided to show up for a room inspection. It turned out that our room and our suitemates’ (the two girls next door to us who share a bathroom with us) room had gotten an infestation of ants from the flooding. I’m appalled that this happened when students like myself pay thousands of dollars to live on campus and get an “enriching” experience –yeah right. All in all, a big part of dorm life is being roomed with people that you get along with. Living in a dorm with other people that make you uncomfortable can lead you to feel unsafe and unwilling to want to ever live on campus again. After I graduate Elgin Community College this semester, I have decided to allow myself to try this again, but with only one other roommate and at a different school, Lindenwood University in St. Louis, Missouri. We get a private bathroom too. The only reason for this though is because the off-campus housing and apartment options were full by the time I was able to select anything because current students get first-pick –how unfortunate. Otherwise, my advice to anyone who wants to live in a dorm, is to only room with one other person, get along with that person, and work as a team to make the school year enjoyable and not miserable. Any student attending a university pays too much to be depressed or live in fear because of a bad roommate and their unwanted posse, like in my case. Oh and one more piece of advice: do not share a bathroom with the room on the other side. Some or none of the students will keep the bathroom clean. You can guess the rest from there on if the bathroom does not stay tidy, especially for girls.